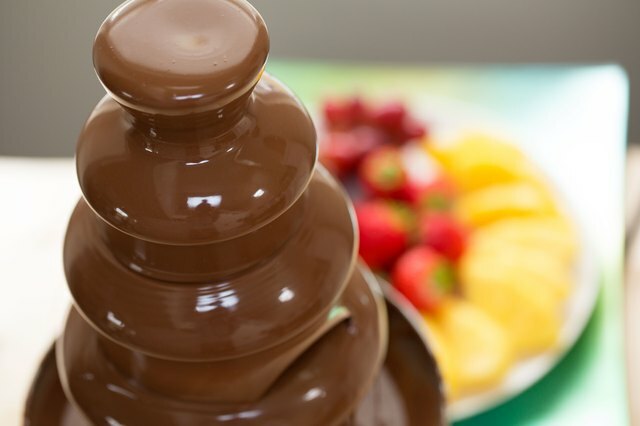 Even the simplest of pleasures are better when shared, which is part of the allure of chocolate fountains. 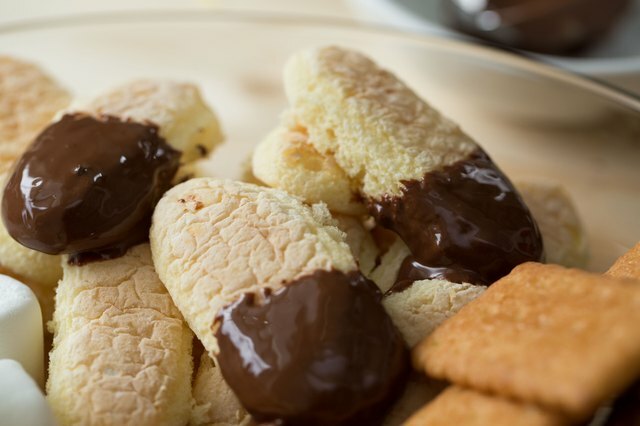 Gathering around the fountain with friends and family tuns a straightforward indulgence into a festive occasion; and few treats are so good that a coating of rich chocolate won't improve them. Fountains range from tiny countertop models to commercial-sized rentals, so they're practical for gatherings of any size. 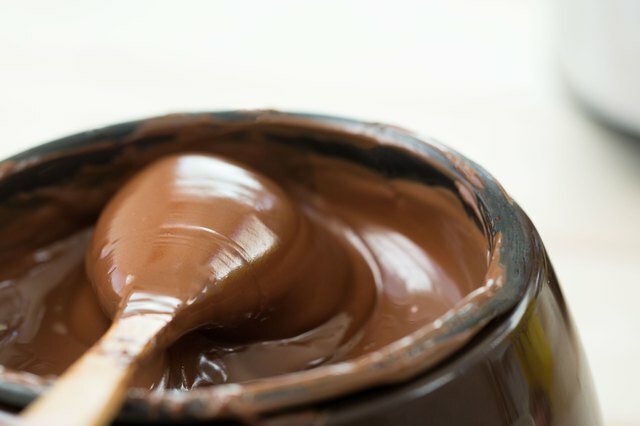 For a fountain to work properly, your chocolate should have the smooth-flowing consistency of light cream when it's melted. 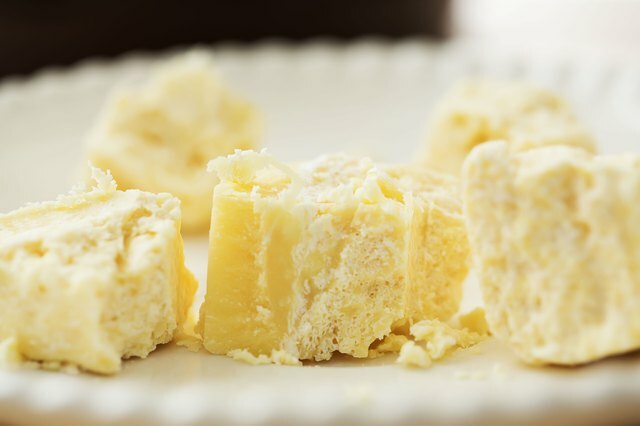 The "couverture" chocolate used by pastry chefs is ideal, with its high percentage of cocoa butter. It's available from gourmet grocers, baker's supply shops and online retailers, and most rental outlets will cheerfully sell you as much as you need when you rent the fountain. If you don't have ready access to couverture or another free-flowing chocolate, you might need to thin ordinary chocolate. Cocoa butter is the best option, but it's sometimes hard to find in smaller population centers. Ordinary vegetable oil works just fine, if that's what you've got. It doesn't take much, just a few tablespoons for the 2 to 5 pounds you'd use in a small fountain. 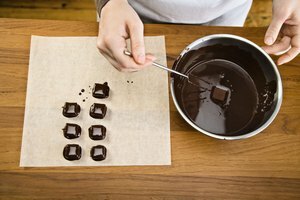 If you don't like the idea of adding oil to your chocolate, consider making ganache instead. The principle is the same, except you thin the chocolate with heavy cream instead of oil. 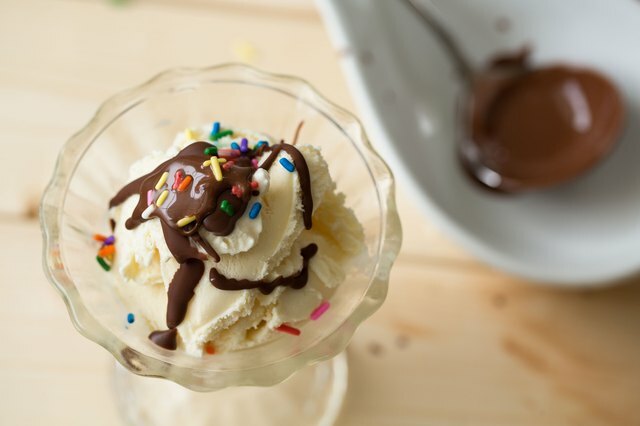 You'll need one part cream to three or four parts chocolate, and a pint is roughly a pound, so a pint of cream and three to four pounds of chocolate is a good ratio. As a bonus, you can use any leftovers as truffle centers. The heating element in the fountain itself is intended just to keep the chocolate flowing, so you'll need to melt your chocolate ahead of time. Gentle heat is the key, so your best bet is a large bowl placed over a pot of gently simmering water. 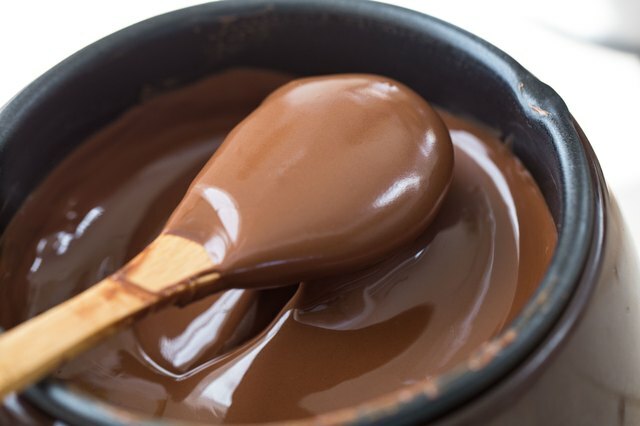 Stir the chocolate as it melts, then add oil, melted cocoa butter or cream -- if needed -- and stir it in thoroughly. Depending how many people you serve, you might need to melt more and top up the fountain occasionally during your get-together. 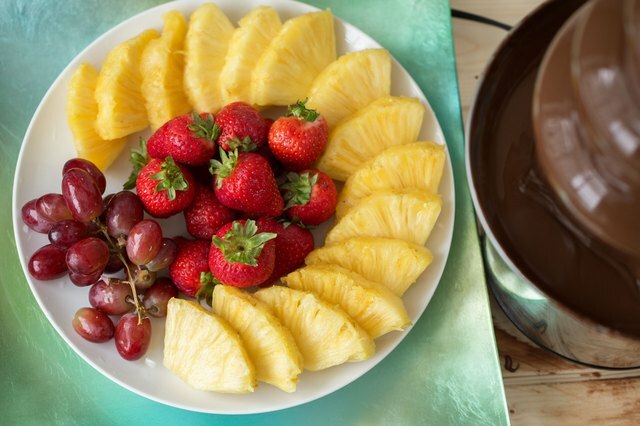 You'll need to provide a quantity of fondue forks or bamboo skewers to use with your foods for dipping. Set out bowls and trays of cut-up foods -- they should be bite-sized to discourage double-dipping -- or put together skewers ahead of time. 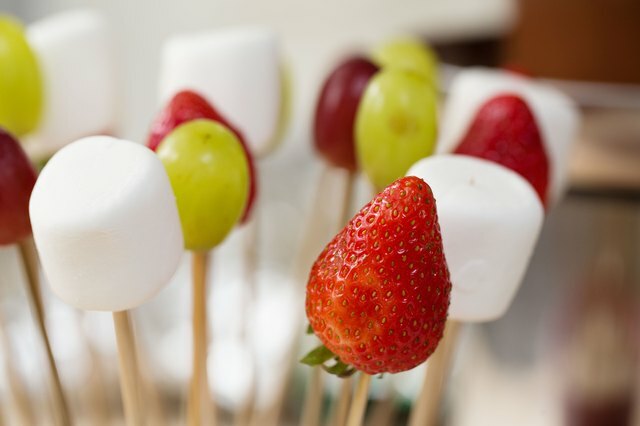 Four to six inches of fruit or other items per skewer is more than ample, but ideally they should be at the end of a longer skewer to keep fingers out of the chocolate. Most fruits and berries, including strawberries, banana segments, and diced melons or pineapple, work well at the fountain. Avoid delicate berries such as raspberries or blackberries, which can fall from the skewers and clog the fountain's workings. If you opt for quick-browning fruit such as bananas, pears or apples, dip them in diluted lemon juice to keep them fresh for longer. Cake balls, squares or fingers of pound cake and angel-food cake, pieces of brownie and blondie, and round or bar cookies can all be dipped in the fountain as well. Choose recipes that are relatively crumb-free, because crumbs and broken pieces of pastry can interfere with the fountain's smooth operation. Some less-sophisticated options can also be fun, especially for kids and those who still have a child-like sense of fun. 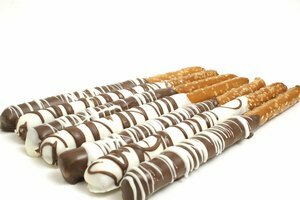 Marshmallows, pretzel sticks, corn or potato chips and licorice whips are all fun for dipping. Alternatively, dip sandwiches of graham crackers and marshmallow fluff to make instant, indoor "s'mores." You can expand your offerings dramatically if you provide a ladle. Bowls of ice cream, delicate fruits, breakfast cereals and crumbly baked goods are all perfectly acceptable when the chocolate comes out, instead of the treats going in. For an especially elegant offering, provide crepes that can be filled with fruit and drizzled with chocolate from the fountain. Large rentals fountains can be quite heavy, especially when loaded up with several pounds of chocolate, so be sure your table is both level and sturdy. If your group includes kids, or if drinks will be served, it's a good idea to have someone monitor the fountain full-time to protect it from jostling and accidents. 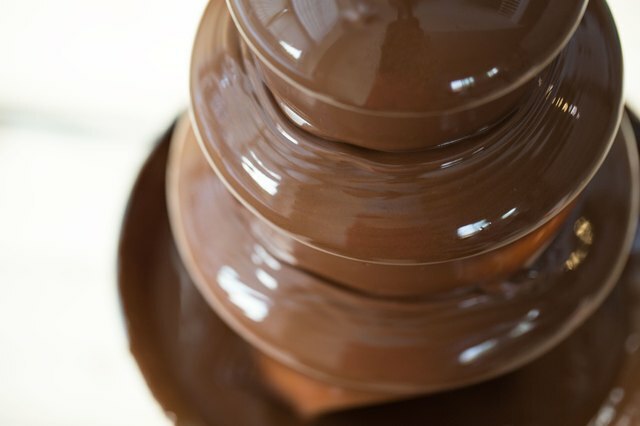 Chocolate is the canonical fountain option, but it's certainly not the only one. 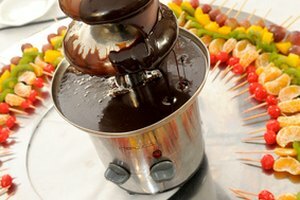 A caramel fountain -- either on its own, or as an accompaniment to the chocolate fountain -- works with all the same dipping options. Filling the fountain with cheese sauce switches it neatly from sweet to savory, and opens the door to a totally different range of flavors and textures for dipping.